TGIF at GReads Week 4: TGIF is hosted by Ginger at GReads - be sure to check out her blog and join in the fun! This week's question: Author Block Party: If you could gather a handful of authors to hang out with, who would you choose? I'd choose authors who's brains I'd love to pick (not literally, I so don't get the whole zombie craze) while we munch on hamburgers and potato salad. You know, all casual-like so it doesn't seem like I'm picking their brains. Who am I kidding, I'm not that smooth. Anyway, I'd invite my two biggest writing inspirations, Nora Roberts and JK Rowling...authors I think are talented and write funny books (funny writing is something I haven't been able to master) like Maddy Hunter, Janet Evanovich and MaryJanice Davidson. Oh, and Sarah Jio, just because she's amazingly talented and a sweetheart, and I'd love to hang out with her (and yes, pick her brain too)! Follow Friday Fun Week 8 - this weekly meme is hosted by Parajunkee and Alison Can Read. Check out their blogs for details/rules, and to join! Also, be sure to check out this week's featured bloggers on each of the girls' sites! This week's question: How have your reading habits changed since you were a teen? As much as I loved to read as a teen, I was so busy that a lot of the books I read seemed to be assigned novels, books to write reports on, research books, etc. My local library had literally one book shelf with young adult books (compared to now where they have more than I can count), and I didn't like my school library's selection, so my tastes were limited. 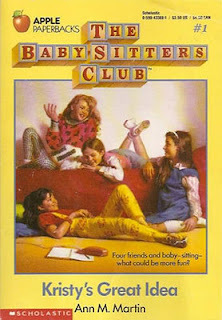 I bought quite a few books back then and my tastes ran mostly to fluff - The Baby-Sitters Club (I kept reading them way after my friends stopped, just because I loved the characters), Sweet Valley High, stuff like that. Now I'll read just about anything - I still read young adult (although not BSC or SVH lol) but I read just about every other genre imaginable, too. Books have changed a lot in the handful (or so) years since I was a teen, and I've changed a lot too. Book Blogger Hop Week 8 - This is a weekly meme hosted by Crazy For Books. Be sure to stop by her blog to check it out. This week's post is here. This week's question: Let’s talk crazy book titles! Highlight one or two (or as many as you like!) titles in your personal collection that have the most interesting titles! If you can’t find any, feel free to find one on the internet! Have a great Friday and a wonderful weekend, everyone! If you participate in Book Blogger Hop, Follow Friday Fun or TGIF - or even if you don't - be sure to leave a comment (I love comments!) and I'll visit you in return! I have zombie books on my bookshelf, but I'm horrible and have not read one. I'm not sure I get it either. I liked the Evanovich book titles at first. They got a bit tedious after a while. I never noticed this, but the individual titles from the Sookie Stackhouse series are kind of great! Dead as a Doornail!! Nora Roberts and J.K. Rowling (who I think is going to be a popular choice today) I would love to hang with too. I used to love Sweet Valley High!!! I forgot about that series! Now anything YA goes :) Great answer! I really enjoyed the Betsy series but for some reason couldn't seem to read the last one. So I cheated and read the last chapter and was okay with it. I guess I just miss the crazy banter between Betsy and Sinclair. 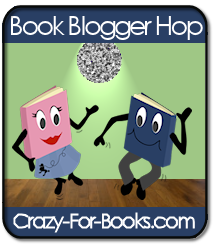 Hi dropping by here from the book blogger hop, some great titles. Pretty blog background. New follower here! I'm also not huge on the zombie thing. They're rotting bodies! Ew! I almost put Janet Evanovich for my author party too. Love her. Just stopping by to share some Friday blog love. Come and join Read My Review on my blog which currently has a Friends theme. Hope you have a great weekend! I easily came up with five crazy book titles just by taking a fast look at my bookshelf. All five come from the same book series. Can you guess which series it is? Here’s a hint – The book series is a trilogy in five parts. I think I read BSC in middle school and in high school I pretty much got out of reading. Barely picked any books up. New Follower, Your answers were cute, mine weren't as cute. Hopping through. Yay for Babysitter's Club. A huge part of my childhood. Love Sweet Valley too. Yes, that is so true... I read a lot more "fluff" when I was younger. Not that fluff doesn't have its place but I guess my tastes have grown more discerning as I got older. I've never heard of the Passport to Peril series, but the titles sound really silly. LOVED Babysitter's Club and Sweet Valley High! Congrats on finishing a novel. I'll be interested to hear on how the self-publishing process goes. I remember reading "The Little Princess" in 7th or 8th grade and it being the first book I couldn't put down even to eat dinner. I search for books like that now. Different times, different world, but still reading. I have 50 books stacked by my chair and the pile keeps growing instead of getting smaller.